Google Will Spend $1 Billion For New York City Campus On Hudson River "In fact, we're growing faster outside the [San Francisco] Bay Area than within it," says Chief Financial Officer Ruth Porat, a senior vice president of both Google and its parent company, Alphabet. Google says it will lease office space at three spots in the West Village to create a new campus for thousands of workers in New York City. Here, a pedestrian passes by 345 Hudson Street, one of the buildings Google will be using. Google says it will spend $1 billion to create a new campus in Manhattan, looking to more than double the number of its employees in New York City in coming years. The company currently has more than 7,000 workers there. The move is the latest high-profile expansion from a U.S. tech giant, following big investments from Apple and Amazon to create office spaces in Texas, New York and the Washington, D.C., metro area. Called Google Hudson Square, the new campus will occupy more than 1.7 million square feet, according to Chief Financial Officer Ruth Porat, a senior vice president of both Google and its parent company, Alphabet. "New York City continues to be a great source of diverse, world-class talent — that's what brought Google to the city in 2000 and that's what keeps us here," Porat says in a blog post about the move. 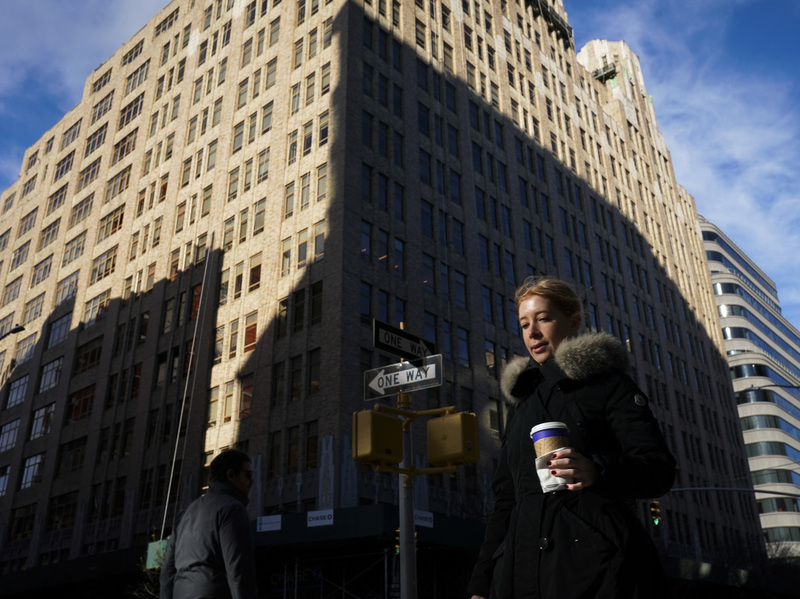 It's Google's second big bet on New York this year: In March, the company bought the Manhattan Chelsea Market building for $2.4 billion. That spot is less than 2 miles north of the planned Hudson campus. Google has opened a string of new offices and data centers in 2018 — from Los Angeles, Boulder and Detroit to spots in Tennessee and Alabama — Porat notes. She adds, "In fact, we're growing faster outside the Bay Area than within it." That echoes what Apple said last week as it announced plans to build a $1 billion campus in Austin, furthering its growth in a city where it already employs more people (some 6,200 workers) than it does anywhere else outside of its headquarters in Cupertino, Calif.
"Talent, creativity and tomorrow's breakthrough ideas aren't limited by region or ZIP code," CEO Tim Cook said last week. As it unveiled the Austin expansion plan, Apple also said it's growing in other spots far from Silicon Valley, with plans to add hundreds of new jobs in cities from Pittsburgh, New York and Boston to Boulder and Portland, Ore. That's in addition to its plans for new sites in Seattle, San Diego and Culver City. The moves from Google and Apple came one month after Amazon announced the results of its much-anticipated search for a place to build its second headquarters. In the end, the online retailer decided to open two new facilities — one in New York City and another in northern Virginia near Washington, D.C. The tech giants bring the promise of high-paying and stable jobs — but because of their immense size and resources, their expansions can also trigger concerns among local residents and businesses. As NPR's Jasmine Garsd reports from New York, Amazon's decision "was met with some public trepidation, and questions over what responsibilities big tech companies have toward communities when they move in." In Google's case, Garsd reports, the company "says it will be investing heavily in New York, including a digital skills leaning center in Manhattan." Mark Muro, a senior fellow with the Brookings Institution Metropolitan Policy Program, tells Garsd that he's worried the advantages tech companies can bring won't be enjoyed by the rest of the country. "It's creating a kind of two-track divide in the country," Muro says, "where a short list of the digital rich get richer, and much of America watches this and is growing impatient, I think." The tech companies say they're simply going where the talent is, as they compete to hire engineers, software developers, database experts and other key staff. They're drawn to areas that have a thriving research and startup culture; it also helps to have enough infrastructure to host a large-scale business. Similar to the rationale laid out by Apple and Google, Amazon said of its plan to open offices on the opposite coast from its Washington state headquarters: "We can recruit more top talent by being in two locations. These are fantastic cities that attract a lot of great talent." The new Google campus will be divided among three addresses in the West Village neighborhood: 315 and 345 Hudson St., and 550 Washington St., Porat says. Google hopes to start moving into the Hudson properties in 2020, with the more industrial Washington Street building ready in 2022.